I'd seen the Gloria Dei (Old Swedes') Church brochure before in one of my passes through the binder, but the other day, I finally read what my grandfather had written in the margins. He wrote about his family's relationship to this historic church in Philadelphia and added some church history. He probably sent this to my grandmother when he was courting her in 1922-1923. I'm so glad he wrote this! I learned something new, and now I have more research to do. What fun! The front page of the Gloria Dei (Old Swedes') Church brochure. 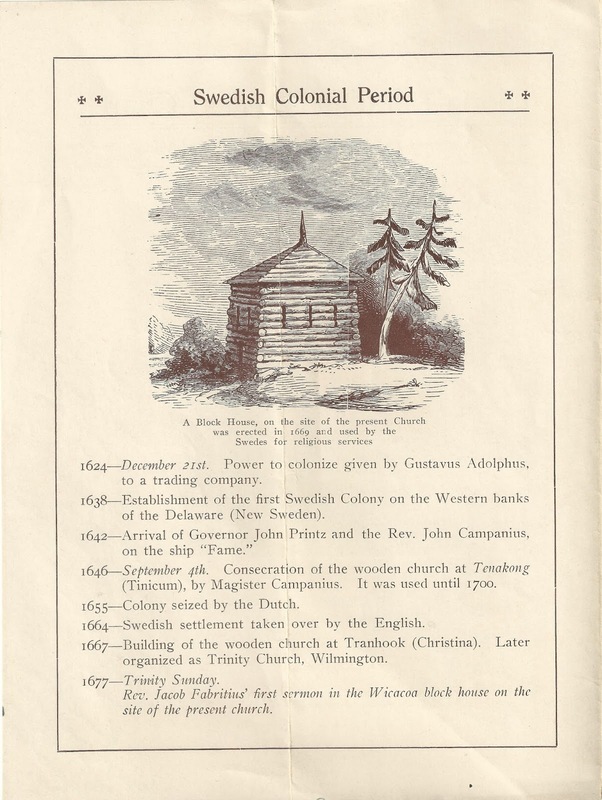 On the left side of the front page of the brochure (above) he wrote: "Grandfather Redles [John Adam Redles Jr.] & family were members of this church. He was a vestryman of this church for about 40 years. Father [George Albert Redles] was babtised [sic] (by sprinkling) in this church and later he was confirmed. Grandfather's funeral services at this church were held when I was 7 years old. I attended [this church and] remember the services." On the right side of this page he wrote: "Graves of Grandfather Redles, Grandmother Redles & 3 of their children [he drew an arrow pointing to the location of the graves]. Great, great, great Grandfather Sandar of Sweeden [sic] the 2nd Sweedish [sic] pastor is also buried in the churchyard. Great, Grandfather von Redlesburg [Johann Adam Roedelsperger] is also buried here." Wow! This is full of information. At the top of page 3, he wrote "The church is now kept up on account of its early history." The bottom says, "The Sweedish [sic] families intermarried with the English colonists. Long before 1842 the congregation thru marriage became English and were largely Episcopalians & no longer Sweedish [sic] Lutherans." The top of the last page says, "Beautiful stained glass windows shed softly colored lights on the interior. 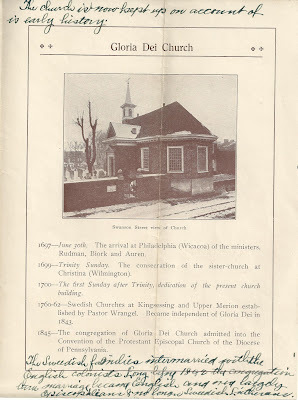 This is the oldest Protestant church in the United States if you count from date of the block house." He has an arrow pointing to "grandfather's pew for his family & himself" and one arrow pointing to where he sat "I remember sitting here during Grandfather's funeral services. I was then 7 yrs old." 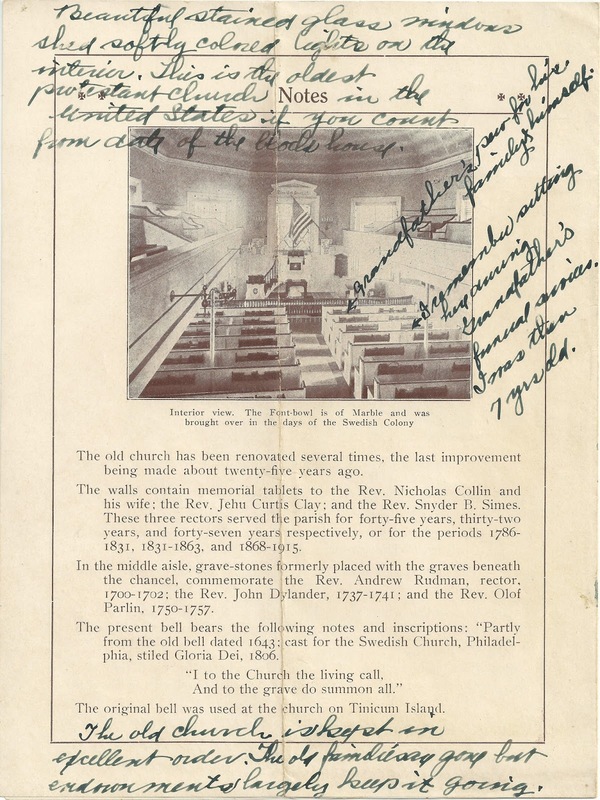 On the bottom of the page he wrote, "The old church is kept in excellent order. The old families are gone but endowments largely keep it going." Now, back to what he wrote on the front page of the brochure. We have since found out that the original Redles family name was not von Redlesburg. Rather, it was Roedelsperger (I've also seen it spelled Rodelsperger and Rodelsberger). At some point, our immigrant ancestor Johann Adam Roedelsperger changed his name to John Adam Redles. The surname Sandar is a new one! I'd never heard that one before. I was very excited and thought "Oh, goody, this should break down a brick wall!" I immediately began researching. 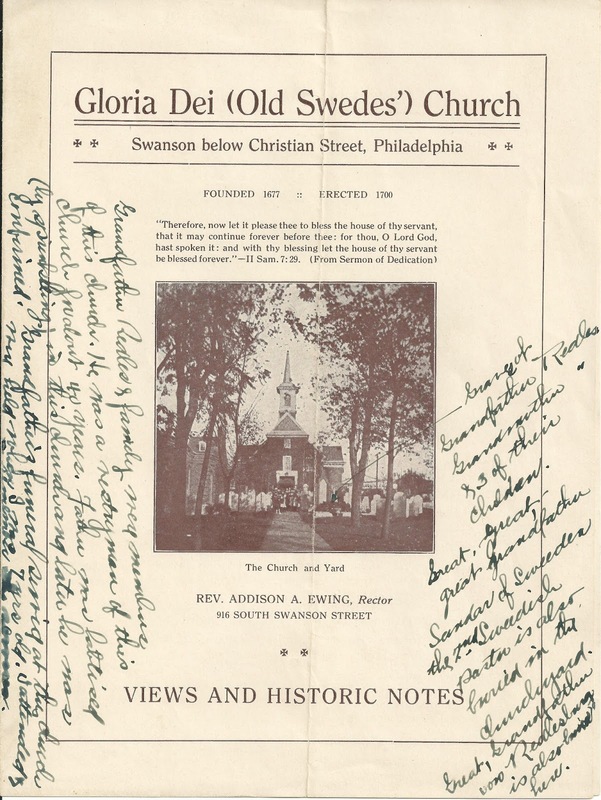 It was fairly easy to find on the Gloria Dei Church's website that the name of the second Swedish pastor of this church was Andreas (or Anders or Andrew) Sandel and not "Sandar" as my grandfather had written. I don't think he's buried at the church, but two of his young sons Peter and Andreas are buried there (see a photograph of their headstones here). I'll write more about my research into Andreas Sandel in a later post, but so far, I've not found a connection to my family. All in all, you just never know where you'll find clues about your family history! Had I not taken the time to finally read what my grandfather had written on this church brochure, I would have missed these tidbits! Catherine, do you have any info on the William Batten Rulon who was an undertaker in Philadelphia in the late 1800's and early 1900's? Looking at the family tree, there are 2 John C. Rulon's. My 3x's great grandfather was John Cooper Rulon (not an undertaker), brother to William Batten Rulon (was an undertaker in Philadelphia), sons of Benjamin C. Rulon of New Jersey. There was another John C. Rulon in Philadelphia, an undertaker. Who I believe is the author of "The Rulon Family and their Decendants". because the address of John C. Rulon on your 2x's great grandfather's death certificate, is the same listed on page 5 of the book; 1313 Vine St. Awesome that you spotted that address because I had wondered if John C. Rulon the undertaker was the same person as the author but I didn't make the connection. I think I got the two John's mixed up in a previous blog post. I better take a look and make a correction. Catherine, we are very distantly related on two sides! I, too, am a descendant of William A. and Sarah Cone Knight (NC to Irwin County, GA), and of Christian Dasher (of the lost town of Ebenezer, GA on the Savannah River). Hello double cousin! Do tell :) Who do you descend from on those two lines?